A black and white portrait photograph of Frederick John Arthur Coleman. 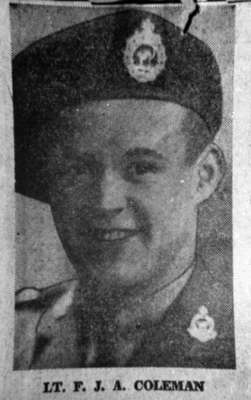 Frederick John Arthur Coleman was born in Toronto on July 28, 1918 and educated at Welland Public and high schools and Whitby High School after his arrival in Whitby in 1936. He graduated from Trinity College, Toronto with honours in 1941 and was captain of Trinity College's championship golf team. He took officers' training courses at Toronto and Brockville and was an instructor in the C.A.C. at Camp Debert, Nova Scotia before going overseas in April 1942. He was reported missing on a flight of a Sunderland flying boat on anti-submarine patrol over the Bay of Biscay on June 13, 1943. According to the Canadian Virtual War Memorial website, he is commemorated on page 147 of the Second World War Book of Remembrance. He is memorialized at the Brookwood 1939-1945 Memorial in Surrey, United Kingdom.